Applications are invited online for recruitment to the post of Panchayat Secretary (Grade-IV) in A.P. Panchayat Raj Subordinate Service for a total of 51 CF and 1000 Fresh vacancies in the scale of pay of Rs.16,400 – 49,870 from candidates within the age group of 18 to 42 years as on 01.07.2018. APPSC Panchayat Secretary Recruitment 2019: Good News Aspirants !!! Here is the Job opportunity came from A.P. Panchayat Raj Subordinate Service for candidates who are looking for settle in Andhra Pradesh Govt Jobs. Andhra Pradesh Government has issued APPSC Panchayat Secretary notification 2019. 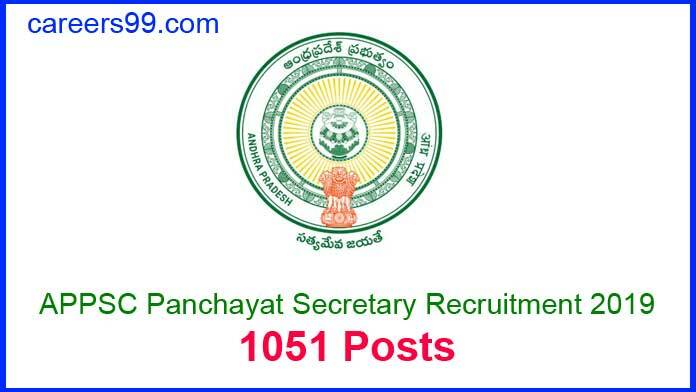 This notification is regarding fill up 1051 Posts for Panchayat Secretary. So, Don’t miss the chance to enter into the Andhra Pradesh Govt job Sector. This is the right time to fill up Andhra Pradesh Panchayat Secretary Application form. The candidates who are eligible for this APPSC Panchayat Secretary Jobs 2019 can apply through the official website. Interested Job Aspirants who are ready to apply for A.P. Panchayat Raj Subordinate Service 2019 Notification must possess the below-given Eligibility Details. Applicants Age should be 18 to 42 Years. Candidates should not be born earlier than 2nd July 1976 and not later than 1st July 2000. 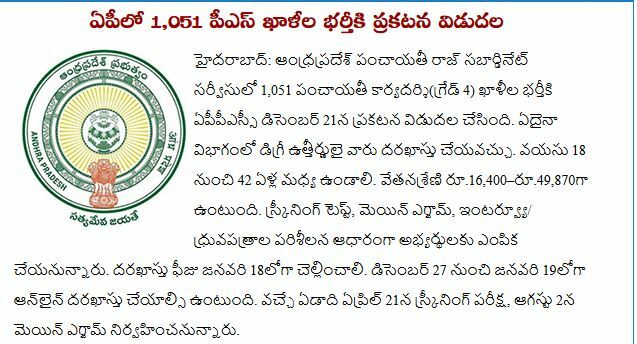 Selected candidates will get As Per Rules by the AP GOVT. The Commission conducts Screening test in offline mode in case applicants exceed 25,000 in number as per G.O.Ms.No.150, Finance (HR-I, Plg & Policy) Dept., dated: 08.08.2016 and likely to be held on 21/04/2019. The Main Examination is likely to be held online through computer-based test on 02/08/2019. There would be objective type questions which are to be answered on computer system. Instructions regarding computer-based recruitment test are attached as Annexure – III. In case any paper of the Examination is held in different languages, the candidate has to choose the medium in which he/she wants to write the examination and the paper will be valued with reference to that medium only. A general Mock Test facility is available to the applicants to acquaint themselves with the computer-based recruitment test. The applicant can visit the website and practice the answering pattern under MOCK TEST option available on the main page of website https://psc.ap.gov.in. However, the Reserved categories of candidates are exempted from payment of examination fee Rs.80/- only. for Details Check Notification below. Before applying for the post, an applicant shall register his/her bio-data particulars through One Time Profile Registration (OTPR) on the Commission’s Website viz., https://psc.ap.gov.in. Once the applicant registers his/her particulars, a user ID is generated and sent to his/her registered mobile number and email ID. Applicants need to apply for the post using the OTPR user ID through Commission’s website. Dear candidates, After you successfully applied for the Panchayat Secretary posts, Get ready to study hard. Because APPSC Jobs have heavy competition. And we are here to provide the syllabus of APPSC Panchayat Secretary recruitment. We Provide Updated Latest syllabus of APPSC Panchayat Secretary Written Test to be held soon. So Download the Latest Syllabus for Panchayat Secretary Written Test from below link. APPSC Panchayat Secretary Recruitment Previous Papers | APPSC Panchayat Secretary Posts Previous Exam Question Papers are uploaded here for the applicants those who have applied for A.P. Panchayat Raj Subordinate Service Recruitment 2019. Job seekers who are going to prepare for the APPSC Panchayat Secretary Exam 2019 can download the APPSC Panchayat Secretary Syllabus & Exam Pattern in a pdf format for Free of Cost from careers99.com. A.P. Panchayat Raj Subordinate Service Previous Papers Free Download | APPSC Panchayat Secretary Exam Previous Papers with Answers are available here in careers99.com to download for free of cost. Here on this website careers99.com, we have provided APPSC Panchayat Secretary Previous Papers in PDF Format and easy to download. APPSC Panchayat Secretary Model Papers are available in the PDF format. To get the good score and also beat the competitors score in the written examination these papers will help you to crack the vacancy. careers99.com Team has updated the free download links in the below section of this page. The subject wise previous papers for Panchayat Secretary exam are available on this page. By practicing the model papers aspirants will be able to get the good score in the written examination.